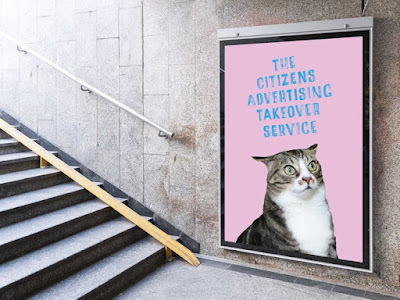 As much as I love the idea of a cat advertising filled station, I cringe at the idea that in order to rid ourselves of the oppressive force of advertising in public space we need to crowd fund 30k+. Not only does this money support the ad infrastructure it critiques, but it further ingrains a public in which purchase is the determining factor for who gets a voice. Ugh. If they make thier goal I will take a field trip to DC to enjoy this. Everyone's invited. Labels: ad takeovers, Other Artists, subway, Washington D.C.